This is a kind of Part 3 of my Ivan Q&A review. I’m going to focus on two particular questions to highlight the problems of communication and understanding between supporters of the same club – who in this case were in the same room listening to the same information from the same person! As it happens, the main subject is my old favourite, the Arsenal wage structure. I expect I’ll get a few comments about how obsessed I am with that. 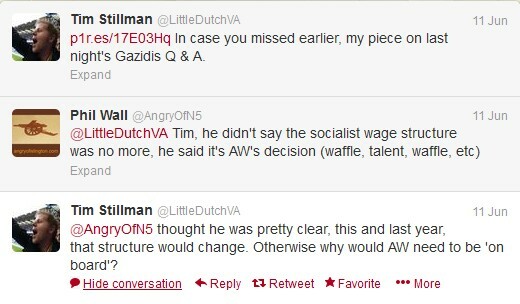 So as an example of where people hearing the same words can reach different conclusions, Tim Stillman (aka @LittleDutchVA) wrote in his own Q&A review on Arseblognews that Ivan confirmed the ‘socialist’ wage structure for players no longer exists. I know Tim, and our views on the state of Arsenal often coincide, but I disagree with his interpretation of Ivan’s words. The problem is Ivan did not just give a Yes or No answer. If that point is reached, Arsène does what he’s told or gets sacked; that point has not yet been reached. So to answer the question for Ivan: The wage structure is what Arsène wants the wage structure to be. If he wants to buy a player for £25m and pay him £12m a year (eg Rooney), then if it fits in the total budget he can do it. If he prefers to buy players for £8m-£12m and pay them all £3m-£5m a year he’ll do that. At the moment he does the latter; if he does the former, the wage structure has changed. For Pedro this was the biggest talking point of the night, and he said as much to me immediately after the Q&A finished. I replied that I wasn’t so sure that’s what Ivan was saying, but without referring to my notes I couldn’t be definite – and anyway Ivan said a lot of stuff, some of which contradicted his other stuff. To be fair, Ivan does talk a lot, as he openly admitted, and it’s hard to keep up and summarise everything accurately. But I think Pedro misheard that one. I think I will suggest Jeremy Paxman to ask the questions next year. That way we might get closer to a Yes or No on some subjects – or at least some more entertainment while Ivan tries to avoid being unequivocal. Still, it’s easy to see how disputes on social media can come about when three of us in the same room don’t hear the same story. As Pedro also said: “I always like the fact that in real life, people have opposing views and still get on. Social media, you have a lot to answer for.” Amen to that. Good summary. If you guys had a hard time keeping up in the room, I’m sure you can imagine what it was like for those of us reading on Twitter. Ha! But very appreciative of all the folks who took time to live tweet the meeting and then post write ups this week. I think it best to ignore most everything that Gazidis and Wenger say though and judge them by their actions. To date those actions have entailed NOT make big signings or paying market wages for elite players. In recent seasons only Fabregas and Henry can be said to have been paid market wages. And these wages have largely been geared to reward them for past performance. Both were represented by Darren Dein who seems the master of the “Retroactive Bonus”! You’re right, and I’ve said it before – actions speak louder than words. I’m awaiting the actions. Yes, that would be “market wages” – assuming your market is confined to oil-money doused boardrooms. Please note that even Man Utd is now choking at the prospect of having more than one player on silly money. Thus Rooney is being shown the door. Nani’s seemingly reasonable demand for 120K per week (in otherwords parity with Ashley Young) is also being denied. Please lay this nonsense to rest. There is no merit on overpaying for players. Only silly journos with nothing to offer continue to peddle this line. They must know that if Wenger concludes with business as usual, meaning the same way it’s gone for the last eight years, he won’t last the year with the abuse that will be hurled at him. Wenger is obviously looking at the clock and refusing to play the rebuilding game any more at his age. Which is why he hasnt re-signed a contract, despite Gasdis practically begging him too. Not coincidentally, the club seems to have found some rather large amounts of change that had rustling around in its pockets. Yeah – keep believing that it is Wenger who has been refusing to spend. He obviously has been taking heat for the board since Dein & Fisman quietly shut down the taps and started letting the likes of Edu and Wiltord walk out the door on Bosmans. As Wenger cryptically hints ever so often: “One day I will tell you”……meaning one day when he has left Arsenal and is not longer bound to a non-disclosure contract. I think you’ll find that he wasnt the one refusing to spend money. Can’t help feeling that this isn’t getting us anywhere Phil. I read Pedro’s blog as well and there was a little difference in interpretation but so what ? Are we any better off now than we were at the end of May ? No . Are the Manx outfits ? Yes . And so are a bunch of other PL clubs. All talk and no action Arsene ? What d’ya think ? I wasn’t there but I was at the previous 2 and I am certain your interpretation is correct. Depressingly Arsenal is still a dictatorship and so long as we scrape 4th we will remain so. Gazidis is attempting to set up Arsene for a fall but its not working. I’ve renewed for next season but I’m not expecting much. Just comparing the 2 (yours and Tim Stillmans) quite different views of the words that IG actually uttered shows that it’s going to impossible for everyone to agree on the meaning behind them. Super post – but Arsene is a very bright guy, too. And subtle. Surely too subtle to be anything other than tongue-in-cheek when he described the wages of young millionaires as ‘socialistic’. Yes, he has the power of decision within the wages/transfers budget. But the reality appears to be that after paying wages, the balance was zero (or thereabouts.) In other word he had to sell in order to buy. It’s a short step to the logical solution: buy young talented players cheap. From there it is another short step to the modus operandi: pay them well to attract them and keep them. Hence the ‘flat’ wage policy, the exodus (starting with Ashley), the deadwood. Given a choice (like a ‘sensational’ budget), it’s hard to imagine Arsene (or any manager) carrying on that way. Well the thing is even more basic than that – to recruit young players in the first place, you have to pay them more than they would earn at most other clubs, not just their existing club. If you are battling out with Man U, Man City, Chelsea etc for these guys you end up paying a lot of money. We have even lost kids to Liverpool because they were getting offered much more there. So its for sure, Arsenal has pay these in-demand young players high salaries from the day the come here. It’s not about “socialism” and I don’t know why we need to keep having that ignorance repeated. Nor is the high pay level a recent development either. It has been well documented that one of Wenger’s first acts upon arriving at Arsenal was to bump up the pay of all the lesser paid first team players (eg Dixon, Winterburn etc) to similar levels as the rest of the first teamers. And he did that to foster team spirit. Nothing knew whatsoever, and I dont know why football fans are so easily sucked up by any old garbage that sports journalists care to peddle.